Today – Tuesday, December 19th – is the last day of school – for 2017, that is. 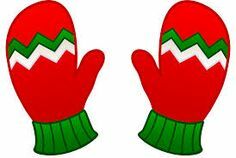 The district’s Winter Break begins tomorrow Wednesday, December 20th and continues through Tuesday, January 2nd. Classes resume on Wednesday, January 3rd. We wish all a very merry and safe winter break. 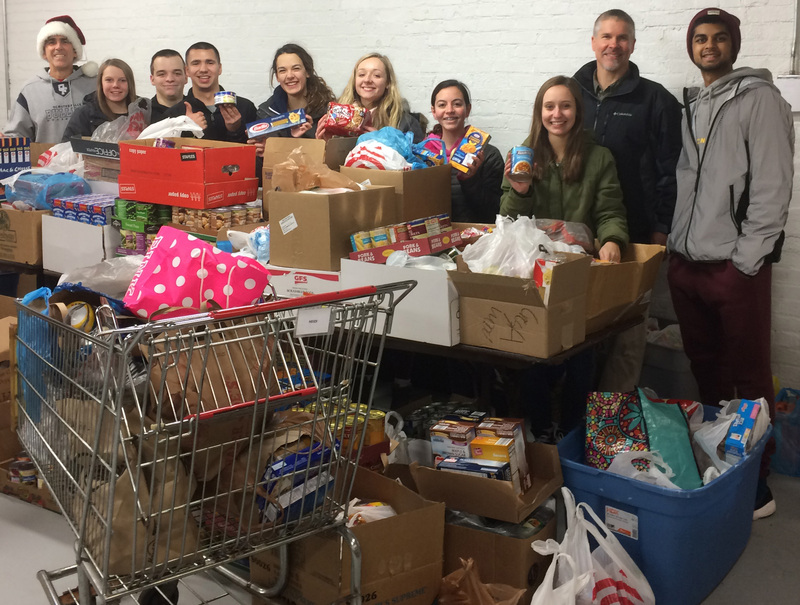 Thanks to ALL who supported and promoted this year’s 12th Annual OFHS Student Council Holiday Food Drive. The drive collected 5,593 items, besting the previous best effort by more than 300 and bringing a 12-year total to 32,703 items! All items were donated to the Olmsted Falls/Township Food Bank to be distributed to local families who are in need. Breakfasts will go to four classes that averaged over 8.5 items per student: Sean Pellerite (1,610), Jenelle Hughes (1,474), Justin Zrenner (1,047) and August/Celaschi/Muzingo (737). Special thanks to Holly Curran and Chris Kemock for allowing us to use the Media Center to store the food the past two weeks and to John Stover, who came up huge by getting us dozens of very needed empty boxes for the food! The following Student Council members – along with Ed August – did the heavy lifting moving all this food from OFHS to the food bank at Olmsted Falls City Hall, so if you have them in class, please give them a special congratulations for their unselfish help on this project: Natalie Moore, Dan Doherty, Shalin Desai, Sara Tonissen, Camryn Moore, Tesa Edwards, Miceala Medwetz Nordstrom, and T.J. Moran. Thank you again for making this another successful project – and Happy Holidays! 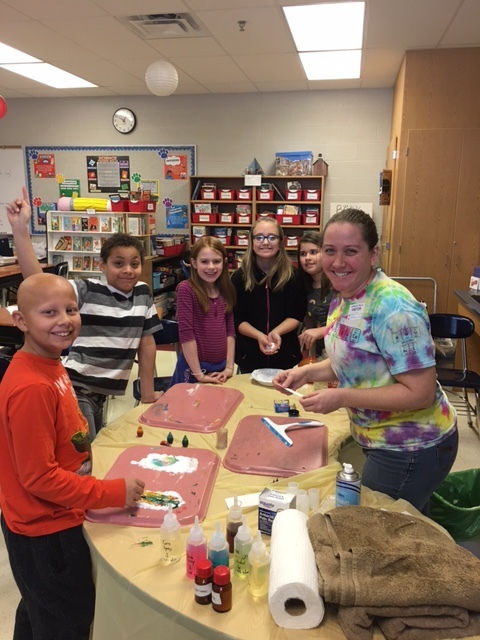 Dr. Lisa Ponton from Baldwin Wallace University visited the Stanczak / Judson / Pilko / Mendicino OFIS team to participate in a variety of chemistry activities. Under the direction of Dr. Ponton, students learned about matter, surface tension of water, density, viscosity and identifying materials that are hydrophilic and hydrophobic. Each student also created an art project out of shaving cream and food coloring! Dr. Ponton and her son, Gabe, a fourth grader in Mrs. Judson’s class, “team taught” at one point in the day! It was a wonderful learning experience for all involved! Maggie McCoy & Zach Wildenhaus are one of two OFHS teams advancing on as semi-finalists! Ms. Dena Kotz’s Business Principles classes have two groups who made it into the next round of judging for their unique business ideas and research for The Veale Foundation/Veale Youth Entrepreneurship Forum contest. The next round will be a video submission pitch to the judges for a chance to present their ideas live at the summit in February if chosen!! WeldHead: welding helmet with Bluetooth speakers inside: Maggie McCoy, grade 12 and Zach Wildenhaus, grade 11 (pictured above). The Badger: innovative design for a post-hole digger: Jeremy Shafer, grade 12, Ben Pohlman, grade 11 and Ethan Short, grade 11. These students worked hard in the first competition of the year. There will be two more competitions coming up in 2018 for their ideas! 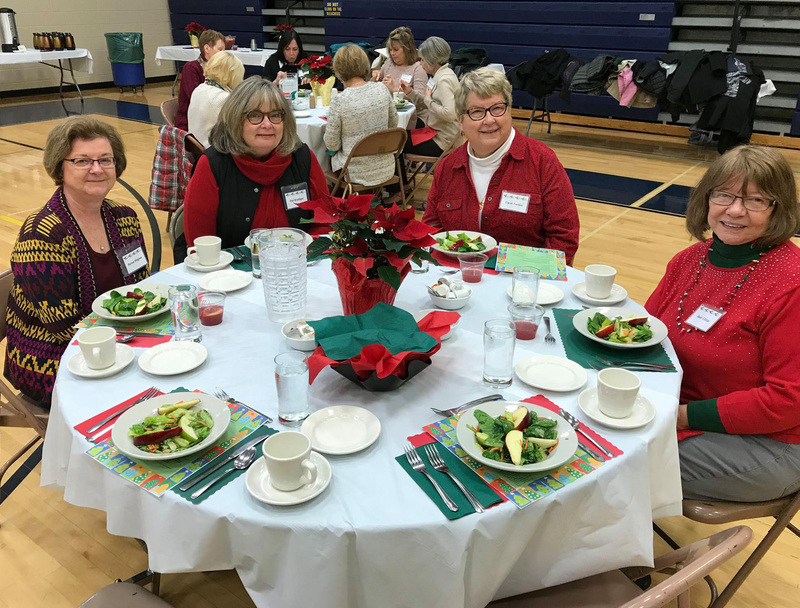 The Annual Retired Staff Luncheon was held Tuesday, December 5th at Olmsted Falls Intermediate School. This was the 25th year for the Christmas Luncheon. Many thanks to the Olmsted Falls Board of Education, OFIS staff and ambassadors, Denise Tabar and food staff, the Golden Harmonies and, of course, the retired staff for their attendance and contributions to the district. Take a moment to check out their December issue! Click HERE to view now. –if you don’t, we do! NO EXPERIENCE NECESSARY TO ATTEND! The December’s Musical Note newsletter is available online. This month’s newsletter that the Olmsted Falls Music Association publishes includes details about the February 3rd annual Super Bowl Hoagie Sale, February 17th Ballroom Blitz, past and future performances and other information. Also, the 2018 OFMA Senior Scholarship is available to download. Click HERE to copy and paste into your browser, which will take you directly to the download section of OFMA’s website. Music seniors, to be considered for the OFMA scholarship, you must complete both the Local Scholarship application and the OFMA scholarship application. 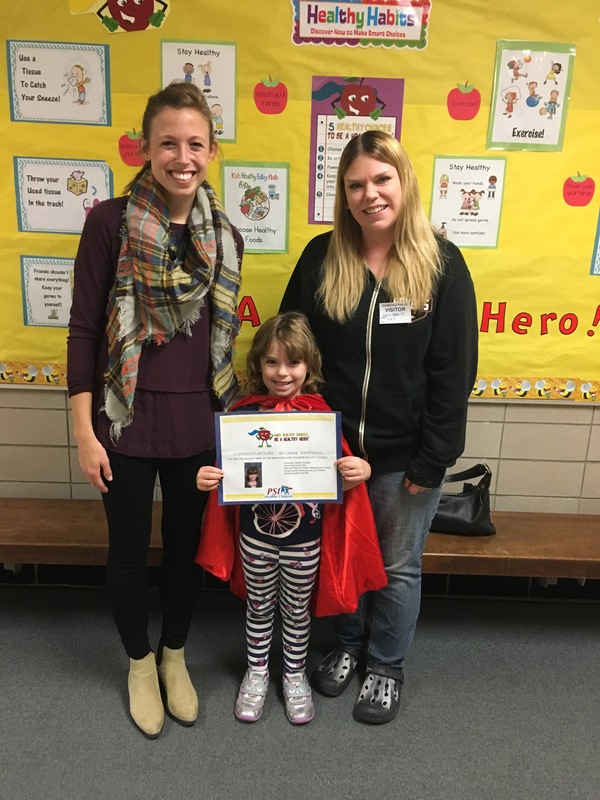 Kindergartner Lexi Gebbie is the November Healthy Hero from ECC. The Healthy Hero program teaches students healthy habits, such as power hand washing, eating properly, daily exercise, sleeping well and coughing/sneezing in one’s sleeve. 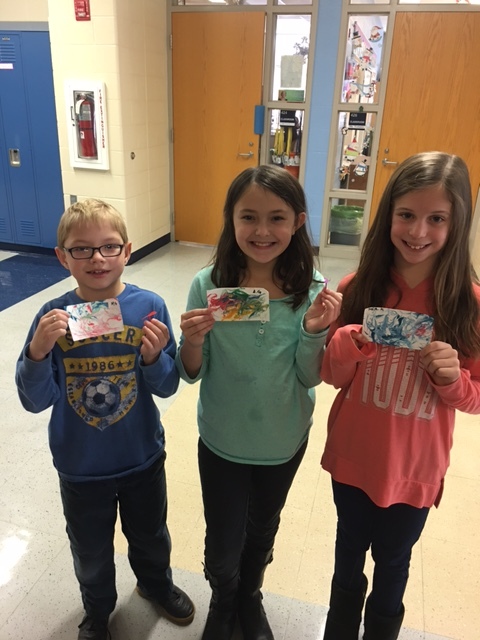 Each student recognized receives a Healthy Hero certificate and $5 gift card to an area store. Congratulations, Lexi. 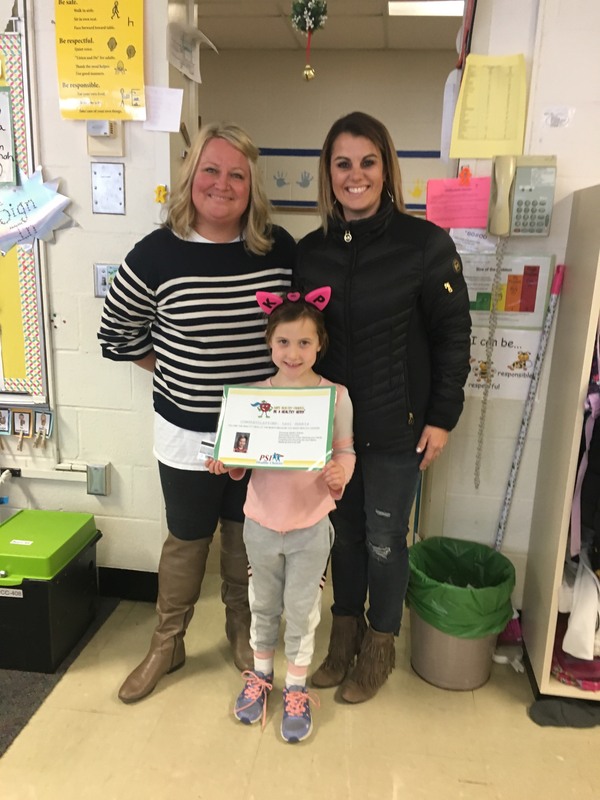 Lexi is pictured here with teacher Mrs. Heinrich and her mother. On Friday, December 8th, all students in grades K-8 participated in an Hour of Code. The Hour of Code is a global movement to encourage students to study Computer Science. A special thanks to Julie Mallory, an Olmsted Falls parent and employee at Hyland Software, for speaking to the OFMS students about Hyland Software and the potential job opportunities related to computer science. The OFIS SWAT (Students Working to Advance Technology) club, led by Mrs. Krock, also facilitated coding activities with all Kindergarten classes. Falls- Lenox and OFIS students participated in coding activities during their weekly technology class. We hope this opportunity will inspire students to continue to learn more about coding and computer science. For more information and additional tutorials, go to www.code.org. To view additional photos from the Hour of Code event, please click HERE. This past weekend the OFHS Academic Team hosted the annual Trash Tournament at the high school. The Trash Tournament is a quiz bowl tournament in which all the questions are pop culture related. The questions are related to music, movies, TV and sports. There were teams that came as far as Ashtabula, too! More than 60 teams attended – a great turn out! Also attending were six alumni who helped at the tournament. Fun, certainly, was had by all. A photo gallery of the event may be viewed by clicking HERE. Local scholarship application is now open through January 8th. All seniors were emailed a link to the application to their OFHS school email. If you have any questions, call guidance, 440-427-6116. The publishers of the 2018 Town Planner Community Calendar for Olmsted Falls have issued a press release to advise the community regarding numerous errors related to the 2017-2018 Olmsted Falls School dates. The publishers recommend that school parents especially make note of the corrections that need to be made to avoid any confusion when referencing your Town Planner Calendar for school related dates for the balance of the school year. The errors are outlined in the press release, which can be viewed HERE. Anyone with questions about this topic is encouraged to Jeffrey Standen at the Town Planner at 216-308-6732 or email at jeff@townplannerwest.com. 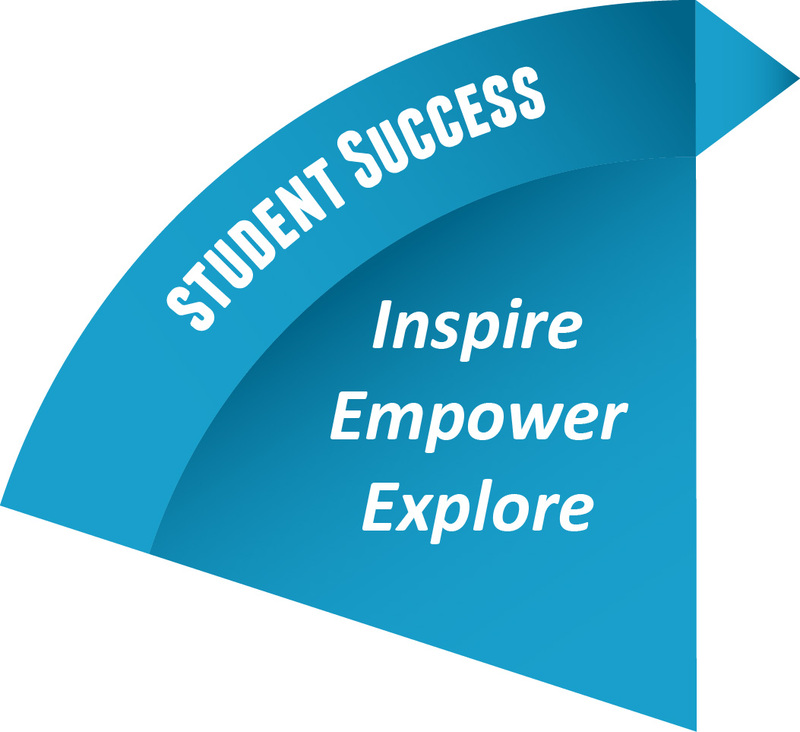 For parents in need of a summary of school year calendar dates for the current 2017-2018 school year, please click HERE. For parents in need of a summary of school year calendar dates for next school year 2018-2019, please click HERE. Reminder: The start, end and break dates for the 2018-2019 school year were recently revised to accommodate the construction project currently underway at Olmsted Falls High School. The Olmsted Falls High School Swim & Dive team’s HoneyBaked ham order will be available this Friday. Pick up is from 5-7 p.m. December 22nd at the Olmsted Falls Intermediate School’s cafeteria. The new pick up site is due to the high school construction occurring now at that location. STILL TIME TO ORDER NEW BULLDOG 3E LOVE T-SHIRTS AVAILABLE; FUNDRAISER FOR OFCS HELPING HANDS! The Helping Hands Annual 3elove Fundraiser ends Friday, December 29th. A portion of ANY products purchased will go towards the fundraiser. All sales are online through December 29th. Visit: www.3elove.com/pages/ofcs-bulldogs to place your order today! All items purchased will be delivered around January 16, just in time for Celebrating Differences Week!!! Please click HERE to view the flyer for more details including the free shipping code!! Thank you for supporting this district wide organization!!! 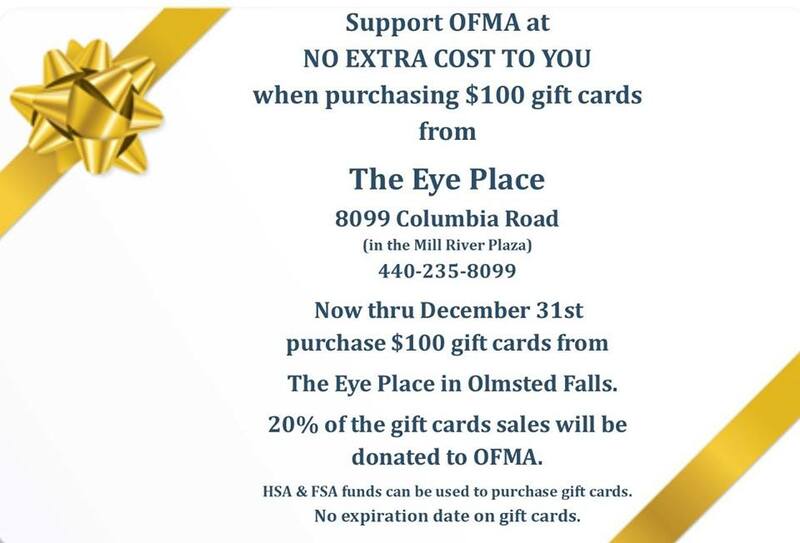 Dr. Scott Sedlacek at The Eye Place in Olmsted Falls continues to sell $100 gift cards now through December 31st. He will donate 20 percent of each purchase to Olmsted Falls Music Association. The gift cards may be used for services and products at The Eye Place. They have no expiration date. Dr. Sedlacek has children in the Olmsted Falls school district and involved in the music programs. T3 Youth Indoor Flag Football of Avon is accepting registration for its January 13th through March 3rd session. Participants are those in kindergarten through grade 4. The cost is $125. Registration deadline is December 30th. To view a detailed flyer, click HERE. The largest indoor recreational vehicle show will run from January 10th – 14th at the I-X Center. The show has more than 600 of the newest RVs under one roof, including tent campers, travel trailers, fifth wheelers and motor homes. It will also feature daily shows from comedy chefs Mac and The Big Cheese who host the Ultimate Outdoor Cooking Show. 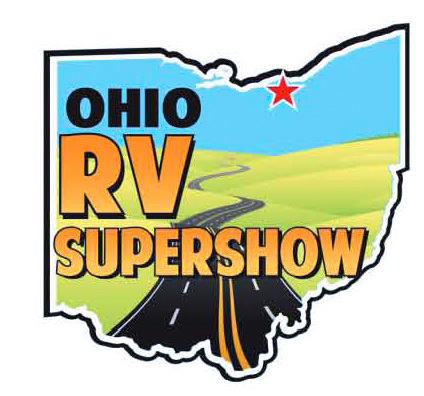 The Great Lakes Recreational Vehicle Association (GLRVA) hosts the 42nd Annual Ohio RV Supershow. Tickets are available at the I-X Center Box Office: $13 for adults; children 12 and under, free and a 2-day pass for $20. Coats for Kids will be onsite Wednesday through Friday. Anyone donating a coat those days will receive $2 off their admission at the I-X Center Box Office. Tickets are available online at ohiorvshow.com. OFHS CONSTRUCTION LIVE WEB CAM! A live video feed has just been launched to enable the community to take a peek at the construction now underway on the south side of our high school building. The view from the camera shows the site of the brand new wing of classrooms being built in the open courtyard space currently adjacent to the south edge of the cafeteria. This new wing will include nine modern science classrooms as well as four art classrooms. For instructions on how to access the feed, visit: http://bit.ly/HSConstructionWebCam and check out the first item in our News section near the top of the page. Thank you to Bailey Communications for donating the camera and the installation! And THANK YOU AGAIN TO OUR SCHOOL COMMUNITY For making this expansion and renovation of OFHS possible! The annual tradition of our talented OFHS music students spreading holiday cheer throughout the school buildings got underway today! Students at OFIS were treated to mini performances of holiday songs as the OFHS choral and band students moved from class to class! Students at OFIS were treated to mini performances of holiday songs as the OFHS choral and band students moved from class to class! 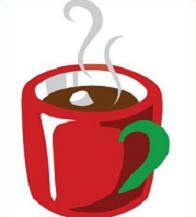 The annual Cocoa & Cram study session for ninth graders is from 2:16-3 p.m. Tuesday, December 12th. The session will offer tips in studying for exams. Stop by and check out the timely recommendations – including maintaining good nutrition, exercise and sleep prior to exams and pacing yourself throughout each test. 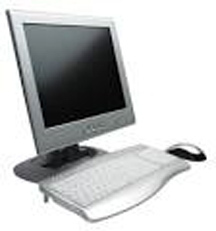 To view a detailed flyer of the event, that includes tips, click HERE. Help decorate FL/ECCPTA’s evergreen tree with winter accessories. 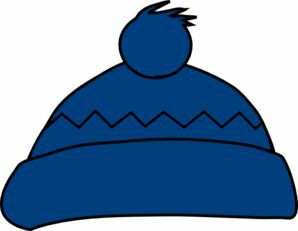 The donations of new hats, gloves, mittens, scarves and warm socks will help local and urban families stay warm this winter. This Winter Accessories Donation Drive runs now through Friday, December 15th. Donation sizes include school-age through adults. Donations will benefit local families through the community’s Christians in Action as well as Cleveland families through the Applewood Center. The donations will be collected at the trees at Falls-Lenox and Early Childhood Center. If your child is in need of any of these items, contact school counselor Mrs. Butto at abutto@ofcs.net or 440-427-6407 to coordinate assistance. Come get you Bulldog Shopping done at the Annual Holiday Sale! Saturday December 9th, 9 a.m. to 1 p.m.
We will have the traditional hoodies, tees and long sleeve shirts, stadium seats etc. Some additional items we will have available are: Bulldog Sports Wall Clings, Hats, Gloves, Jackets, Bags, Water Bottles, Mini Football Helmets, PJ pants, Jewelry (leather wrap bracelets; Bulldog charm bracelets), Decals, Socks and More! We have items for all the Bulldog fans on your list! The OFHS National Honor Society is now taking orders for its Poinsettia Sale. Plant sizes range from 4- to 10-inches and prices, $5 to $15. Colors are red, white or pink, depending upon the desired size. Delivery dates are Dec. 7 or Dec. 14. The Olmsted Falls Swim & Dive team again offers its annual Holiday HoneyBaked Ham Sale now through December 15th. The group receives 20 percent of each order, which goes directly to help pay for pool time. A web page allows you to order gift cards that will be mailed directly to you from the HoneyBaked Ham corporate office. The web page is https://honeybakedfundraising. 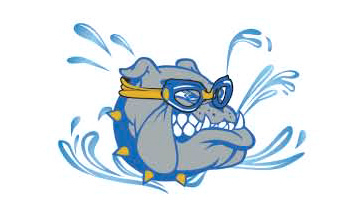 com/fundraisers/ofhs_swim_dive or by clicking HERE. The web page, however, is only for gift card purchases, but you may also order gift cards with the group’s order form by clicking HERE. Orders will be available for local pick up along with all other items on the form. This is a great gift for employees and/or co-workers. If you have or know of a local business that may be interested in a large order for employees, we can arrange for a separate delivery. Orders will be available for pick from 5-7 p.m. Friday, December 22nd at the Olmsted Falls Intermediate School’s cafeteria – due to construction at the high school. All orders and payment must be sent to Tamira Kennedy or to the OFHS office by December 15th. Contact Tamira, 440-915-7904 or tami_kennedy@yahoo.com with questions. NEW BULLDOG 3E LOVE T-SHIRTS AVAILABLE; FUNDRAISER FOR OFCS HELPING HANDS! The Helping Hands Annual 3elove Fundraiser is underway!! A portion of ANY products purchased will go towards the fundraiser. All sales are online through December 29th. 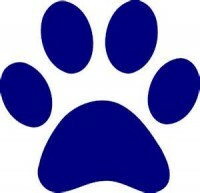 Visit: www.3elove.com/pages/ofcs-bulldogs to place your order today! Dr. Scott Sedlacek at The Eye Place in Olmsted Falls is selling $100 gift cards now through December 31st. He will donate 20 percent of each purchase to Olmsted Falls Music Association. The gift cards may be used for services and products at The Eye Place. They have no expiration date. Dr. Sedlacek has children in the Olmsted Falls school district and involved in the music programs. 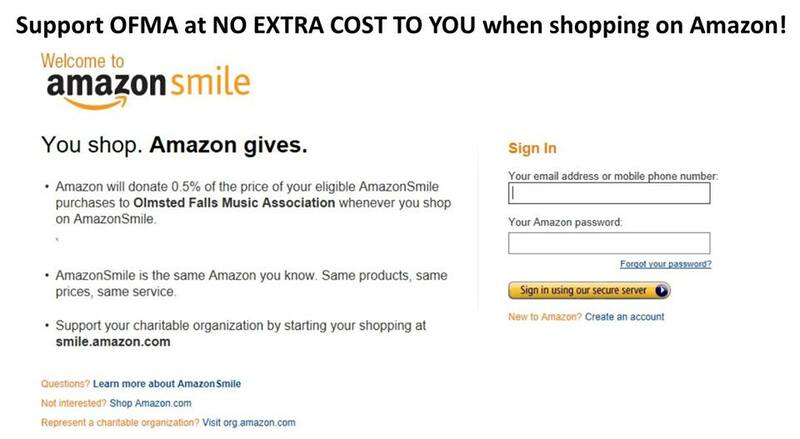 The Olmsted Falls Music Association also is set up as a charity on Amazon Smile. Customers should select “Olmsted Falls Music Association” as their charity first, then shop at AmazonSmile, which has the same Amazon products. Amazon will donate .5% of the cost of the purchases to OFMA. OFMA’s fundraisers proceeds support scholarships for graduating music seniors, music camp scholarships and grants to the music program. Attached are jpeg files that may be shared on your social media platforms to help announce these specials. Boy Scout Troop 201 will have its final Christmas Tree Sale this Saturday at Schuster’s Greenhouse, 9165 Columbia Road. Its hours are 9 a.m. to 5 p.m. Please stop by, support Scouting, and pick up a reasonably priced Scotch Pine, Fraser Fir, White Pine, or other tree. Helpful Boy Scouts will carry the tree to your car for you! 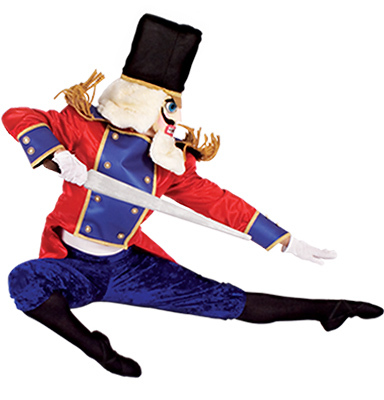 A number of Olmsted Falls students are dancing in North Pointe Ballet’s, The Nutcracker. The performances are December 8th, 9th and 10th at various times. There is a 6:30 p.m. December 7th sensory-friendly performance and a 10:30 a.m. December 8th student matinee. To view a full schedule and ticket information, click HERE to go to the ballet website. Olmsted Falls High School held its annual Local Scholarship Sponsor Appreciation Breakfast this morning in the school’s Media Center to express thanks and appreciate to the more than 80 local individuals, families, businesses and organizations who contribute to the Local Scholarship program. Highlights of this year’s recognition event included a buffet breakfast and special holiday performance by the school’s always impressive Golden Expressions singing group. Guests also were treated to a series of video thank you messages from several Bulldog alumni who were recipients of generous scholarships last year. Thank you to alums Sam Vas (Valparaiso University), Julia Russo (Kent State University), Andrew Ade (Ohio University), Haya Saadeh (Bowling Green State University), Alex Kho (Clemson University), Alyssa Tonissen (The Ohio State University), Anthony Kukura (Baldwin Wallace University), Stephanie Schroth (Vanderbilt University), Kelly Garrity (The Ohio State University), Cassidy Fudale (Cuyahoga Community College), and Molly McCafferty (Harvard University) for taking the time to provide these heartfelt and personal messages of thanks to our local scholarship sponsors. Thanks to the generous support of the more than 80 local individuals, families, businesses and organizations who contributed to the Olmsted Falls Local Scholarship Program during last school year, over $125,000 in local scholarship funds were awarded to students in the OFHS Class of 2017. More than 260 local scholarships were awarded to graduating seniors last year, thanks to the generosity of our community. To learn more about becoming a sponsor in the 2018 OFHS Local Scholarship Program, please contact Sandy Smith at 427-6116. Thank you again to all of our 2017 local scholarship sponsors! Olmsted Falls School District sincerely appreciates your valuable contributions to our students’ futures! Congratulations to the OFHS student athletes recognized this week for their achievement of being named Scholar Athletes for their respective teams or being named as 1st Team All SWC student-athletes! For more on this year’s Scholar Athletes from OFHS, please click HERE. For more on this year’s 1st Team All Southwestern Conference Athletes from OFHS, please click HERE. Congratulations again to all of these outstanding student-athletes on this accomplishment! All Olmsted Falls City School District buildings – including Falls-Lenox Primary School – will be in session this coming Tuesday, December 5th, during the special runoff election for the office of the Mayor of the City of Olmsted Falls. Ohio Law permits the Board of Elections to use school facilities for polling locations and logistics prevent to Board of Elections from relocating the normal polling location. As a result, Falls-Lenox Primary School is the official polling location for all precincts within the City of Olmsted Fall and the Cuyahoga County Board of Elections does plan to use the Falls gym as usual for this special election. This will be the only polling location in use on Tuesday, December 5th. OFCS Superintendent Dr. Jim Lloyd personally emailed Falls-Lenox parents earlier this week to advise that Falls-Lenox Primary School WILL BE OPEN and operating a normal school day schedule on December 5th. The polling location will be isolated to the Falls gym and we will utilize security tables to prohibit people from wandering into the main building areas. Voters will NOT be permitted to proceed beyond these barriers for any reason. Additionally, the school district has been in contact with the Board of Elections officials to secure additional on-site law enforcement during school hours. We are confident that these extra measures will ensure the safety and security of our students and staff. If you have any questions or concerns, please do not hesitate to contact Dr. Lloyd at 427-6000 or Falls-Lenox Principal Mrs. Barrett at 427-6400. 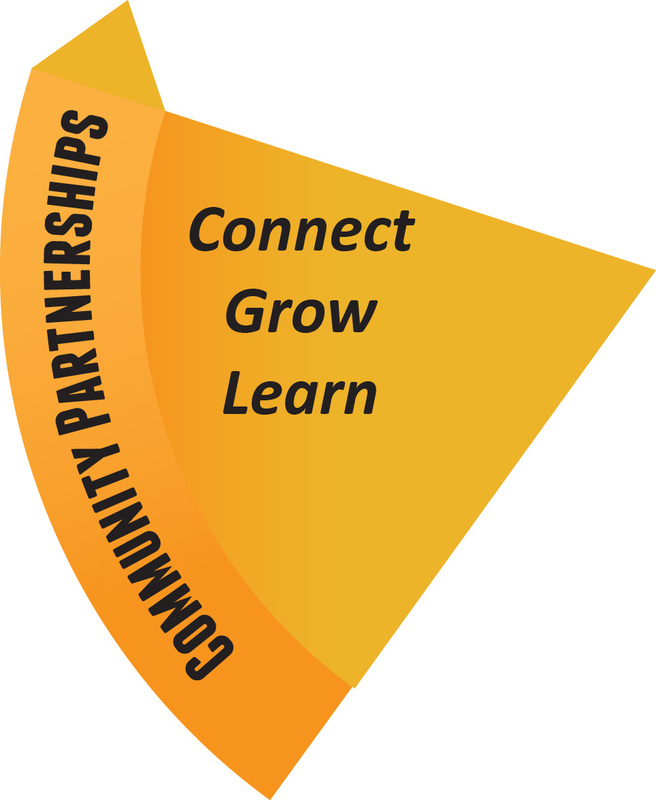 Thank you for your continuing support of Falls-Lenox Primary School! 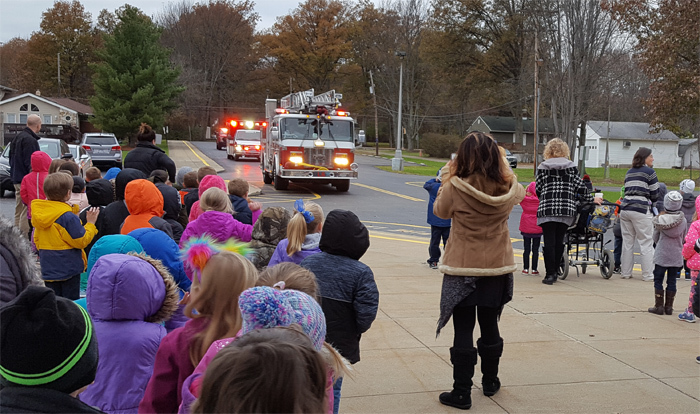 ECC kindergartener Brody Zoellner in teacher Angela McNeeley’s class, created a very detailed fire safety poster that was submitted to the Olmsted Township Fire Department during October’s Fire Safety Month and chosen as the winning entry. Fire Chief Patrick Kelly, who chose the winning entry, drove Brody, his dad and his brother to ECC on Friday, November 17th, in a fire truck to celebrate! Chief Kelly and the township firefighters escorted Brody into the gym, where they also presented a fire safety program to all kindergarteners. Firefighter Jake put on all of his fire-fighting gear so the kids could see they didn’t need to be afraid of him if he was crawling through the smoke to find them should a fire occur in their house. We all learned a lot. We know now why firefighters wear red suspenders! Congratulation to Brody, whose poster will be sent on to the next level of competition! This school year’s latest Healthy Hero is kindergartener Brianna Kaufman. The Healthy Hero program teaches students healthy habits, such as power hand washing, eating properly, daily exercise, sleeping well and coughing/sneezing in one’s sleeve. Each student recognized receives a Healthy Hero certificate and $5 gift card to an area store. Congratulations, Brianna. In the photo with Brianna is her mom, Jessica Badowski and Miss Hubbard, her homeroom teacher. 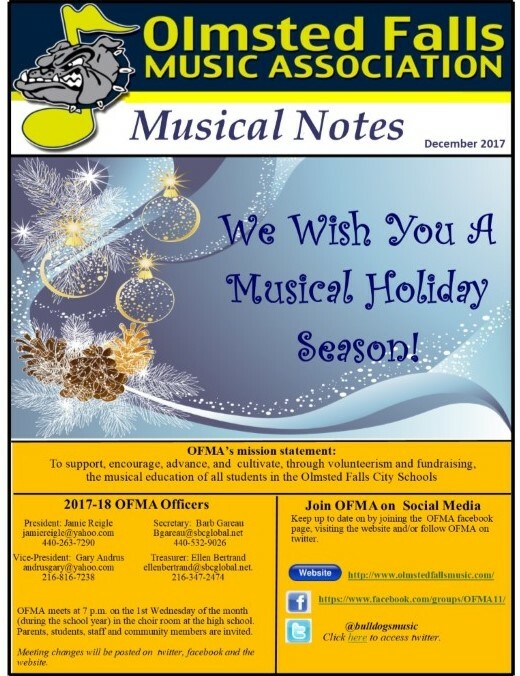 The November issue of Olmsted Falls Music Association’s newsletter, Musical Notes, is now available to download and read. Go to the download page on OFMA’s website, http://www.olmstedfallsmusic. com/downloads, to download this issue or past issues and read about the great music programs in the Olmsted Falls City School District. Winter concerts, which are coming soon, also are listed. 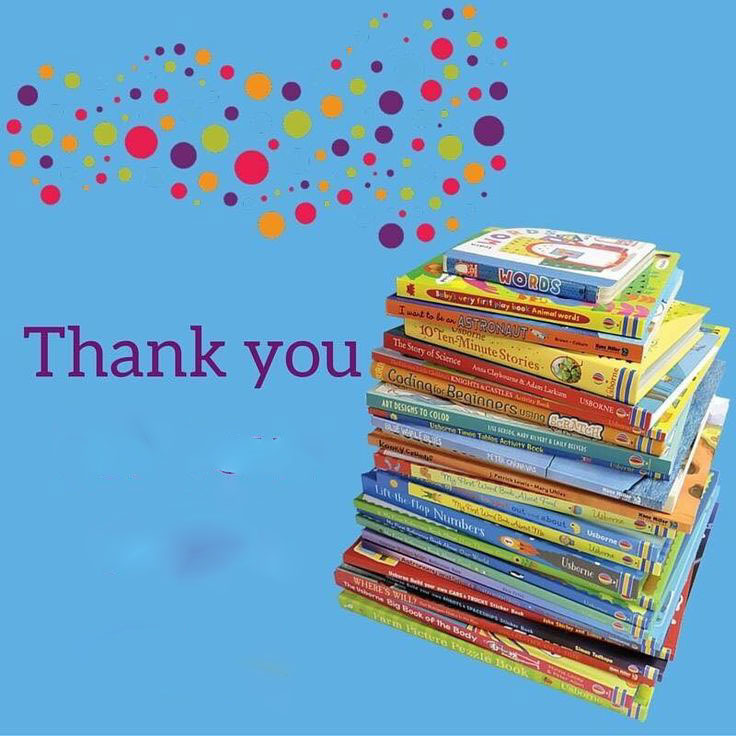 A big Thank You to all who participated in Falls-Lenox Primary School’s recent Book Fair during parent/teacher conferences. The Book Fair was a complete success. All students gain when families bring home the gift of reading. Thank you! The Middle School Media Center had another very successful November Book Fair. Thank you to the students, parents and staff who supported the fair. The Media Center was able to purchase tons of new books with profit from the fair. Also, a huge thank you to our wonderful PTA who volunteered their valuable time. This Winter Accessories Donation Drive runs from this Monday, December 4th through Friday, December 15th. Donation sizes include school-age through adults. Donations will benefit local families through the community’s Christians in Action as well as Cleveland families through the Applewood Center. The donations will be collected at the trees at Falls-Lenox and Early Childhood Center. 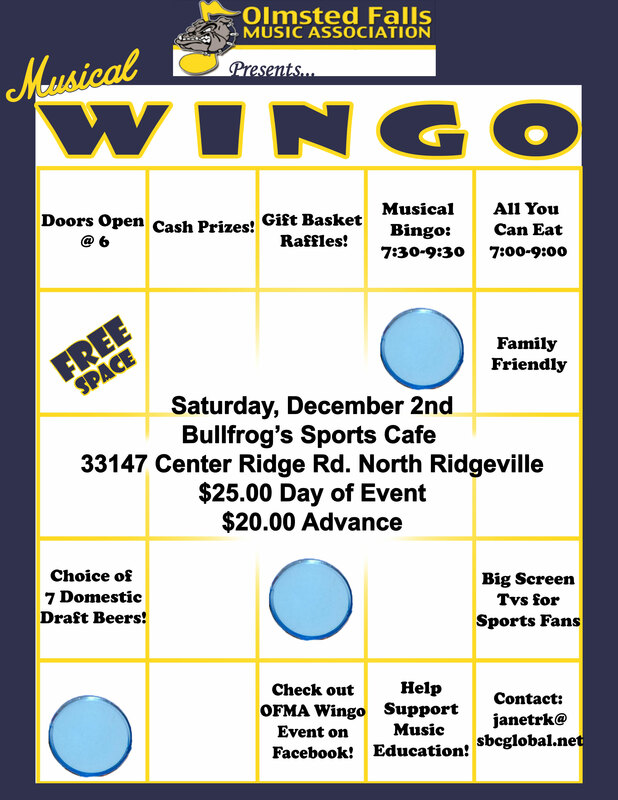 The Olmsted Falls Music Association has its Musical Bingo, better known as Wingo, this Saturday, December 2nd at Bullfrogs Sports Café, 33137 Center Ridge Road, North Ridgeville. The all-you-can-est wings, grub and refreshments is from 7-9 p.m. with musical bingo from 7:30-9:30 p.m. Doors open at 6 p.m. Advance tickets are $20 or $25, the day of the event. Boy Scout Troop 201 continues its annual Christmas Tree Sale at Schuster’s Greenhouse, 9165 Columbia Road. Dates remaining are this Saturday and Sunday, December 2nd and 3rd and Saturday, December 9th. Hours are 9 a.m. to 5 p.m. on the two remaining Saturdays and 11 a.m. to 5 p.m. this Sunday. Please stop by, support Scouting, and pick up a reasonably priced Scotch Pine, Fraser Fir, White Pine, or other tree. Helpful Boy Scouts will carry the tree to your car for you! Questions? Call Mike Knaggs at 440-610-8465 or email msknaggs92@sbcglobal.net. Bring your youngster from age 10 and younger to this Saturday’s Santa Secret Shop at Falls-Lenox Primary School. The Olmsted Falls Cub Scout Pack 102 sponsors this annual event from 9 a.m. to 1 p.m. Saturday. Kids may shop for holiday gifts for family and friends with the help of our friendly “elves.” Most items are under $10. Check out the holiday raffle of terrific items including the new Xbox One X game system and a Vitamix blender, plus crafts, photo booth and food for purchase. Admission is free. All proceeds benefit Cub Scout Pack 102 in Olmsted Falls. Kudos to OFHS freshman Rebecca who took action following the recent hurricanes to raise funds for those in need! “After hurricane Harvey hit I saw the pictures of the devastation. Knowing that Irma was on the way, I wanted to do something to help. I created this custom artwork, and with the help of my parents I had it printed onto water bottles that could be sold.” 100% of the profits from the sale of these bottles went to help the Puerto Rican relief fund set up by the Cleveland Foundation. The effort was such a success that Rebecca plans to continue to sell the water bottles to help further relief efforts. If you are interested in supporting Rebecca’s personal efforts to help victims of the recent hurricanes, please email hurricanewaterbottles@outlook.com for additional information.